One of my passions when traveling is learning about as many aspects to the countries culture. This includes languages and cuisine. Before I met Adam my knowledge of Polish cooking was pretty much limited to pierogi, kiełbasa , cabbage rolls And borscht. In the last few years I’ve learned a couple more dishes from his mother. Today I’m going to show you one of the classic breakfast dishes of the polish people. 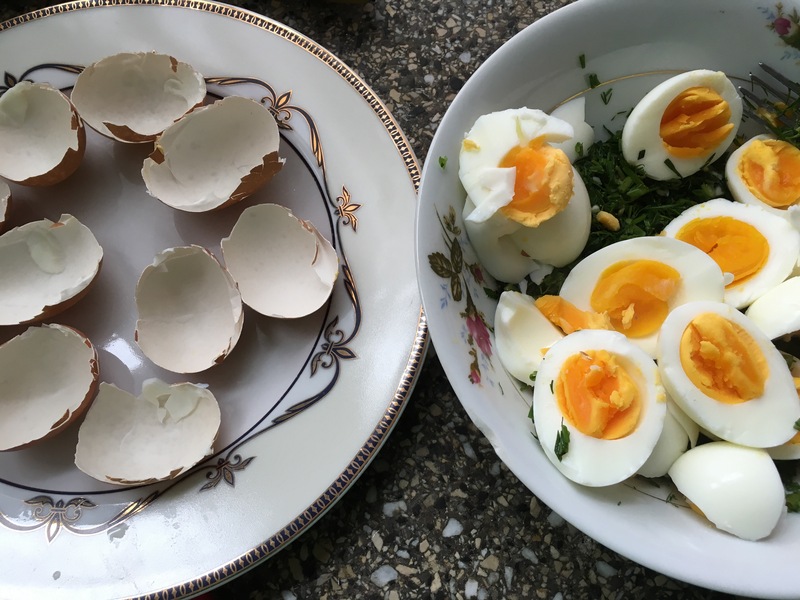 This is one of Adams favourite ways to prepare eggs and if made right you will experience a fresh, tangy, crispy and eggy delight. As mentioned in my previous recipes like those who play by ear, I cook by palate. Meaning I don’t actually have exact measurements of ingredients but rather I rely on my senses to recreate dishes and I challenge you to do the same! I also practice in efficiency and practicality so my recipes are written in the way that, whatever takes the longest is done first. It may seem I jump around a bit but read it first to avoid confusion and all will be clear! 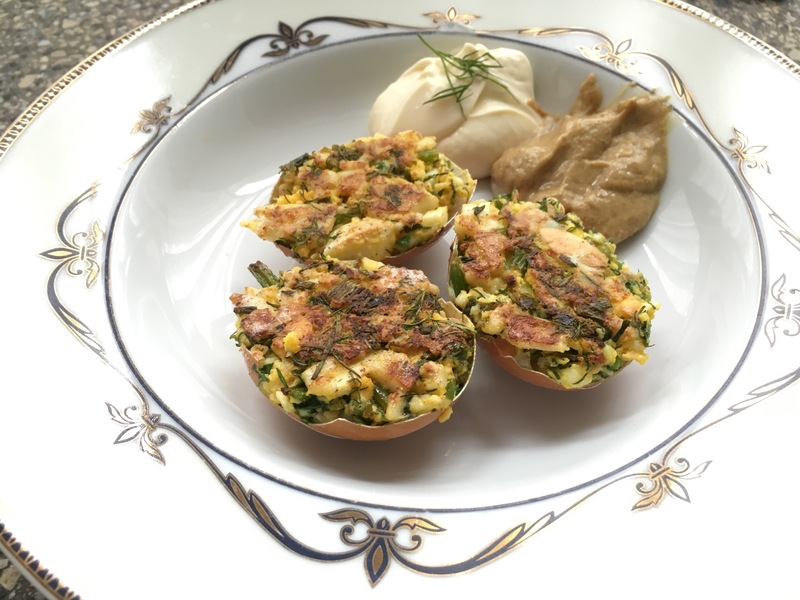 The secret to crispy Jajka Faszerowane is to ensure you have soft-medium boiled eggs. You want a little bit of the yolk to still be soft so that when you mix the stuffing it will stick together as it cooks. 1. Bring a small pot of water to a boil and then add your room temperature eggs. Set a timer for 7-8 minutes. (Factors that can affect this time; elevation, humidity, “room temperature” whatever that means). While the eggs are boiling it’s time to prepare the stuffing. 2. Finely chop the dill and chives. I usually bundle both these together and chop it all at once. Place in a medium mixing bowl. 3. Add salt and pepper and a healthy splash of lemon juice. Mix well. *** 4. 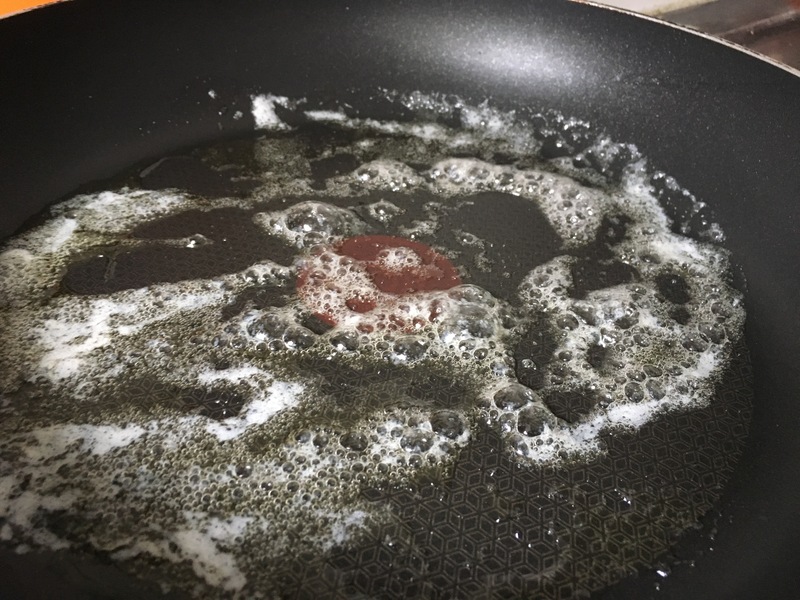 Once the timer goes off remove the eggs from heat and pour out the water and rinse with cold water to arrest the cooking process. 5. 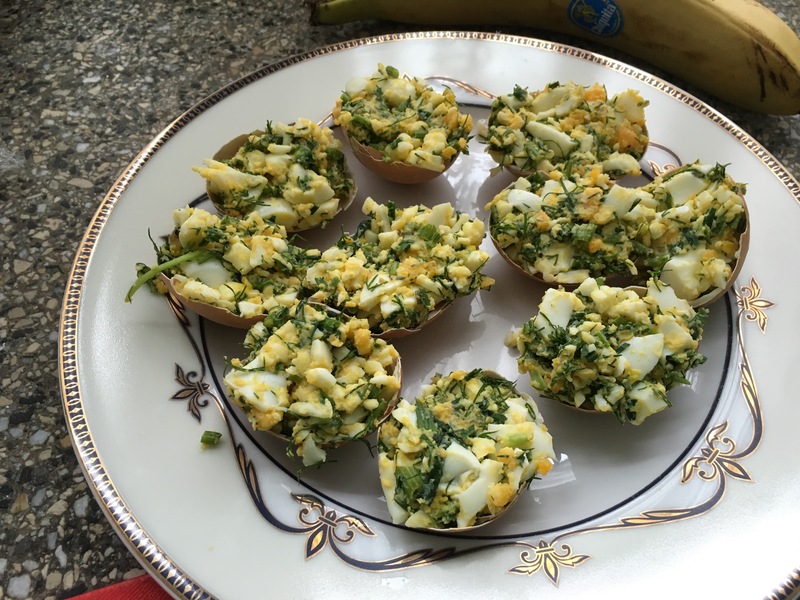 Using a sharp knife cut the eggs IN THE SHELL, in half, lengthwise. We’ll be using the shell to hold the shape of the filling. 6. 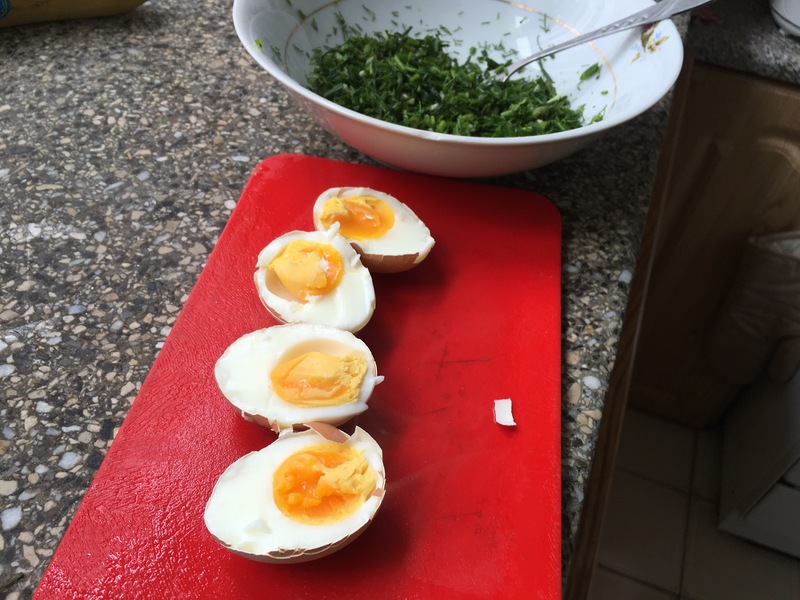 Gently scoop out the egg, without breaking the shells and put the boiled eggs in the mixing bowl with the dill and chive mixture. Set aside the empty half shells for now. 7. 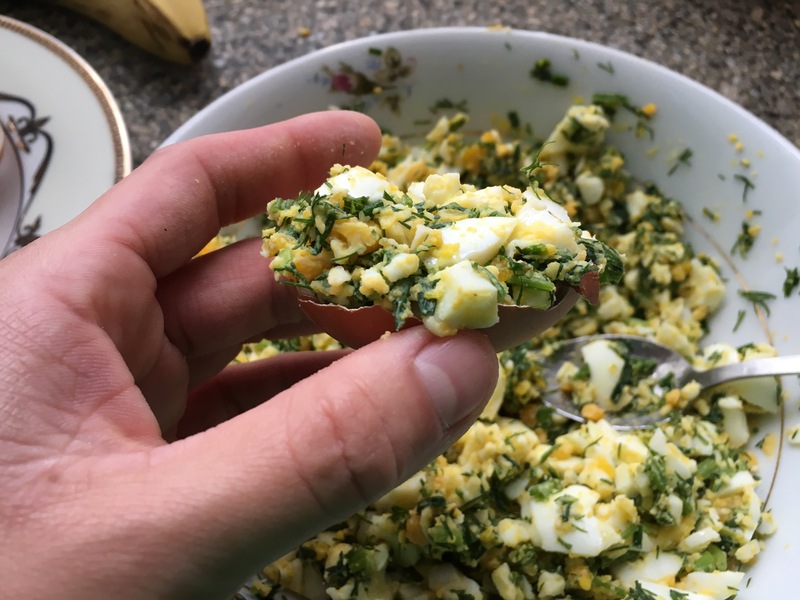 Mash the eggs well with the dill and chive mix. Taste to see how you like the balance of salt to pepper to lemon. Should be a little tangy but not sour. 8. 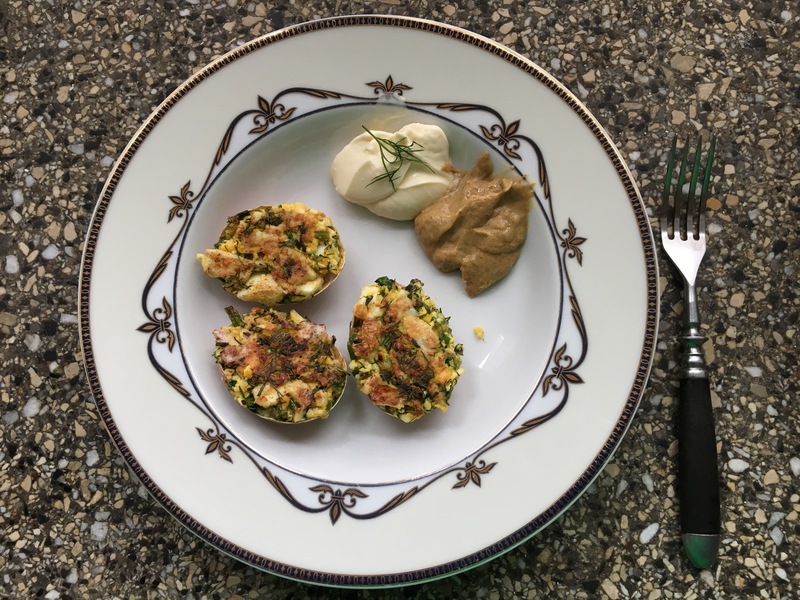 Once you’ve happily and thoroughly mashed the eggs, gently fill and pack the stuffing back into the shells. 9. Heat a medium sized frying pan on low- medium with enough butter to lightly coat the entire pan. 10. 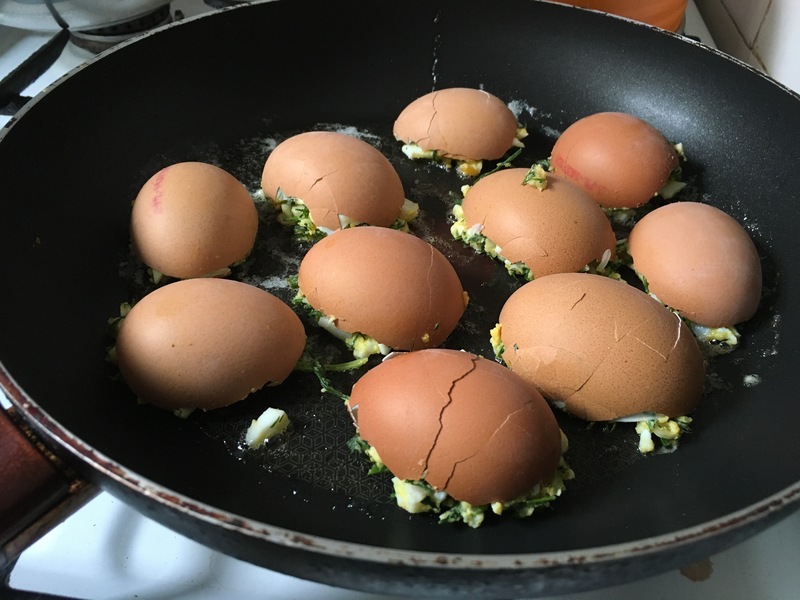 Place the stuffed eggs on the frying pan with the shell up and filling down. 11. Cook the filling until golden brown (10-15min). I hope you enjoy this little bit of Poland and please let me know what you think!